Where to Stay in Calgary: Advice from a Calgarian and travel blogger about the best neighborhoods to stay in Calgary, Canada! Disclosure: This Where to Stay in Calgary Guide contains affiliate links. That means we may earn a small commission when you use the links on this site to book a hotel, buy your travel insurance, etc.. You don’t pay anything extra. If you’d like to learn more about how this works, you can read more under our Disclaimer page. Long referred to in the stereotypes of steak, cowboys, and conservative oil culture, Calgary has changed a lot over the past decade, and it seems people are waking up to the fact Alberta’s southern city has a lot to offer. 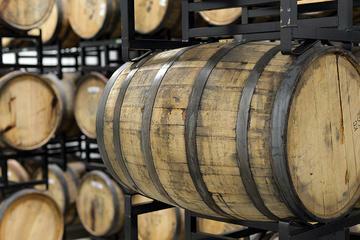 These days, when travellers visit Calgary, the most common reaction is one of pleasant surprise at the food and drinks scene, the shopping, the arts and culture, and the unpretentious and always-warm hospitality of Calgarians. Gone is a downtown filled with restaurants catering to oil execs with corporate cards, replaced by cool craft beer bars and hipster fusion spots. As Calgary has thrived and suffered over the decades due to its economic tie to oil, so have the successive oil booms and busts shaped and re-shaped the city’s character and demographics. Today, Calgary is led by North America’s first Muslim mayor, and the younger generation seems to be turning politics on its head as their votes give the long-incumbent Conservatives a run for their money. Come in the summer, and you’ll find Calgarians meeting friends on patios, rafting down the Bow River, or heading out of town to enjoy the hiking, canoeing, camping and fishing that can be done less than a day’s drive away. In July, the entire city’s population dons its best cowboy attire without any hint of irony or self-consciousness, and digs in for the 10-day citywide party that is the Calgary Stampede. In the winter, Calgarians are stoic about the weather, frequently commenting on the sunny blue skies they enjoy all year round, and waiting for the next chinook — a unique weather phenomenon that can see winter temperatures yo-yo from -25c (-13F) to +10c (50F)…overnight — to arrive for a temporary reprieve from the cold. With friendly people and loads of cool things to eat, see and do, there’s really no bad time to visit Calgary! And after moving to Calgary way back in August 1986 (!) I’m thrilled to share my Calgary expertise in this Where to Stay in Calgary Guide. Downtown: Close to all major venues, public transportation, shopping, and lots of restaurants, downtown is easily recognizable as the big clump of buildings in the centre of the city. Downtown is central and convenient, and is one of the best places to stay in Calgary for all types of trips, and is convenient for both walking and public transit. The Beltline: Just south of downtown and Calgary’s commercial/corporate core, the Beltline is known for its trendy bars and restaurants, boutique shops, and convenient location close to Calgary Stampede and the Saddledome (for hockey games and concerts). If you’re looking for nightlife, the Beltline is the best place to stay in Calgary. East Village: A relative newcomer among Calgary’s trendy neighborhoods, the East Village is squished between downtown and the Belt Line at the east end of downtown, very close to the Calgary Stampede and the Saddledome. The East Village has high urban density and the associated fixings: high-end supermarkets and nice bars and restaurants. If you’re looking for an up-and-coming vibe and convenience to downtown and the Stampede. the East Village might be the best area to stay in Calgary. Inglewood: Inglewood is one of Calgary’s few historic neighborhoods, and the buildings provide a glimpse into Calgary’s past. Mixing historic buildings with a few trendy restaurants and shops, Inglewood is close to the Calgary Zoo and Fort Calgary. Inglewood is the best location to stay in Calgary if you want a quiet neighborhood feel mixed with history, and don’t mind being a bit further out. Hillhurst-Kensington Village: On the north side of the Bow River but still convenient, this is a trendy area known for local merchants, coffee shops and wine bars. This area is as busy with students as it is with young professionals and families. Kensington is one of the most coveted and best neighborhoods in Calgary for residents, so there’s no reason you won’t enjoy it, too! Canmore: An hour drive west of Calgary, Canmore is a great base outside of Calgary if you’re visiting Alberta for a skiing Holiday. A picturesque mountain town close to many ski resorts, Canmore is quaint, cute and well-located. Bowness: A suburb in northwest Calgary close to Winsport (Calgary’s only urban ski hill) and ski/snowboard rental shops, Bowness has easy access to the Trans Canada Highway if you’re just looking for an overnight stop before heading out to the Rocky mountains. Bowness might be the best part of Calgary to stay if you plan to hit the mountains. Southern Calgary: Staying in the southern end of the city provides great access to hit the open road and explore The Cowboy Trail and southern Alberta’s old western towns. What’s the Best Area of Calgary to Stay for the Calgary Stampede? Where Should I Stay in Calgary to Visit the University of Calgary? Where to Stay in Calgary Near the Airport? Heading to Vancouver Next? Check Out Our Where to Stay in Vancouver Guide for the Best Spots to Stay, or Book a Day Trip to Banff, the Columbia Ice Fields, or the Drumheller badlands from Calgary. Downtown Calgary is the business and financial hub of the city, recognizable as the big clump of tall buildings smack-dab in the middle. Most visitors to Calgary stay in the downtown, and for good reason: there are lots of restaurants, cafes and shops; it’s generally quieter in the evenings than the more nightlife-focused Beltline; and some of Calgary’s main attractions — the Glenbow Museum, the Calgary Tower, the National Music Centre, and the Convention Centre — are within walking distance. The pedestrianized (open to vehicles in the evening) Stephen Avenue (8 Ave) is filled with shops, bars and restaurants between 1st Street SE and 4th Street SW. For shopping, the Core Shopping Centre is a massive three city-block, four-floor mall that also connects directly to Bankers Hall, a more upscale shopping centre, and Scotia Centre. Being right in the centre of the city, he Calgary Stampede grounds are easily accessible for the Stampede itself, trade shows at BMO centre, or Hockey games. And of course, the C Train is free while in the downtown core along 7th Avenue (but not the Stampede/Saddledome stations), and shopping and great restaurants are aplenty! 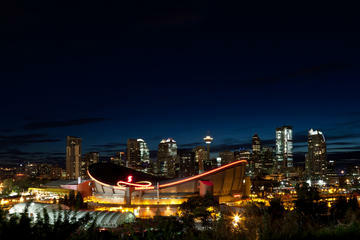 If you’re in Calgary for business, shopping, a hockey game, or the Calgary Stampede, consider staying in the downtown! Hotel Le Germain Calgary — Luxury, high-tech, business and boutique…all rolled into one. Located steps from the Calgary Tower and within easy reach of the Calgary Stampede and Saddledome and all the sights downtown has to offer. There is an on site bar, restaurant and spa. The Fairmont Palliser — This hotel has been a historical Calgary icon for many years. Luxurious rooms, plenty of on-site dining options, indoor pool and health club. Across the street from the Calgary Tower and Telus Convention Centre and walkable to the Saddledome and Stampede grounds. Even if you don’t stay here, it’s worth stopping by. Calgary Marriott Downtown Hotel — This hotel features multiple restaurants, a 24-hour business centre and even a laundry room. Close to the Calgary Tower, Telus Convention Centre and the Stampede. An indoor pool, hot tub and gym on site. Continues to be one of the top-rated hotels in the city. Sheraton Suites Calgary Eau Claire — Located at Eau Claire Market on the bank of the river where you’ll find some trendy bars and restaurants, interesting shops and a nice cinema. Everything downtown has to offer is easily walkable from here. The hotel features an onsite restaurant and pub and an indoor pool and hot tub. Hyatt Regency Calgary — A trusted name in the hotel world, very close to the Calgary Tower, Telus Convention Centre, a block from an LRT station and a block from Stephen Avenue pedestrian mall. The Stampede Grounds and Saddledome are very close as well. Hotel has an indoor pool and jacuzzi. The Westin — A popular hotel in the downtown core, close to all that downtown has to offer. Indoor heated pool and fitness centre – they will even lend you New Balance gear to use in the gym. A cocktail bar and a great steakhouse on site. Holiday Inn Express — A nice budget friendly option in the west end of downtown a block from an LRT station. Clean and comfortable rooms and the hotel offers free parking. Downtown Calgary is nice and flat so walking to most attractions is quite easy! Ramada Hotel Downtown — Closer to the centre of downtown than the Holiday Inn so that’s main reason for it being my pick. Clean and modern rooms and hotel offers a buffet breakfast and lunch. It’s a great location for visiting all the downtown attractions as well, and close to public transportation. Stampede is about a 25-minute walk. Sandman Hotel Calgary City Centre — Good value, modern and clean rooms on the west end of downtown. The hotel features a pool, fitness centre and a business centre. Close to Moxie’s restaurant and downtown attractions are walkable. The C-train LRT is very close. The Beltline is the area immediately south of the Downtown core, but still technically considered part of downtown. It is made up of four separate neighborhoods more-or-less between 11th Ave. and 17th Ave., and is full of young people living in condos and apartments. 17th Avenue gained local infamy as the place to celebrate during the Calgary Flames’ (hockey) run to the finals in 2004, when it was nicknamed the “Red Mile” to reference the Flames’ red hockey jerseys. 17th Ave. is filled with bars, nightclubs and restaurants and is well known for it’s pre/post hockey game crowd due to its proximity to the Saddledome. During the Calgary Stampede every July, 17th Ave. has some of the “must go” places to get right into the Stampede spirit. 11th Ave. is also filled with bars and restaurants, and together with 17th Ave, make up the most happening non-residential streets in the Beltline. As the area is filled with residents, it’s also full of amenities such as small supermarkets, coffee shops, ATMs and other services. This area is a popular place to live, the closer you get to the Saddledome/Stampede grounds, the rowdier it can get. If you’re looking for the best area to stay in Calgary for nightlife, the Beltline is a good bet. It’s also a good area to stay for attending an NHL game or the Calgary Stampede, and is very close to all the downtown shopping complexes and sights. Fairfield Inn & Suites — A great choice for business or pleasure, and has options for medium-length stays with rooms that include a separate seating area and work station. There are two restaurant choices on-site, but many off-site restaurants and bars close by. A great affordable choice for the Stampede – 15-minute walk to the Stampede/Saddledome. Hotel Arts — An artsy, design boutique hotel with a fun vibe, Hotel Arts is a popular spot for the Stampede given its proximity to both the Stampede grounds and 17th Avenue. Tasteful modern designer touches throughout the hotel, and a nice restaurant on-site, with other trendy eateries nearby. Complimentary bike rental on request. Best Western Plus Suites — A bit further away from the Stampede and Saddledome on the west end of the Beltline, but still very walkable in about 20 minutes. Just 2 blocks from the famed 17th Avenue ‘entertainment district’ with loads of restaurant and bar options. Rooms offer a bit more space with a separate work area. It also has coin laundry on-site and offers free underground parking. 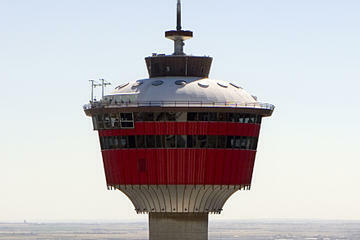 Get your general admission tickets to the Calgary Tower here. Stand on a glass floor 626 feet (191 meters) above downtown Calgary! Book a Calgary City tour here. Choose from a 3.5 hour or a 5.5 hour tour (which includes Heritage Park) with a professional driver and guide. Tour the city of Calgary at night, enjoy incredible views and learn about the city and its architecture from your driver and guide. Almost a full day of touring, sampling and eating through Calgary’s best craft breweries and pubs. Oh, and did I mention sampling? A recently revived area just north of the Calgary Stampede grounds at the east end of downtown, the East Village is home to the recently opened and beautiful StudioBell (the National Music Centre), an anchor venue that incorporates the King Edward Hotel, a beloved local live music venue. The area was carefully planned from the beginning to be an active community, and includes riverside walkways, connections to Calgary’s vast network of cycling paths, St.Patrick Island on the Bow River, and easy access to downtown, Inglewood and the community of Bridgeland. More and more businesses are opening in this area, making it a coveted new neighborhood in Calgary. So far, this hasn’t translated into a wealth of hotel choices, with the 4-star Hilton Garden Inn being the main options in this area. Hilton Garden Inn — A new hotel in a newly revitalized area. The location is perfect, steps from downtown attractions like the Calgary Tower, and just a short walk to the Stampede grounds and the Saddledome. The LRT is also right outside. Rooms are clean and comfortable, everything you’d expect from Hilton. Need Some Inspiration and Ideas While in Calgary? Check Out This List of Tours in Calgary to Get Started! Inglewood is one of the more historic neighborhoods of Calgary, established in 1875. As such, it was Calgary’s first ‘downtown’ and the original main street is now 9th Avenue SE which runs through the heart of the district. A trendy neighborhood with local artisan shops, small theatres, cozy pubs as well as fine cuisine. A decent option for those looking for a a longer stay in the city, or those travelling with a car. The Saddledome and Stampede Grounds are about a 25 minute walk from the centre of Inglewood, as is the Calgary Tower and many of the other downtown attractions. There is no LRT serving this area directly, City Hall or Bridgeland stations are both a 20 minute walk from the centre of Inglewood, but there are buses that will take you into downtown that run along 9th Avenue. For stays in Inglewood, we’d suggest checking out HomeAway, VRBO, and – of course – Airbnb to find a holiday apartment. The Kensington Village area of Hillhurst is just across the river from the west side of downtown, and is considered one of the best neighborhoods to stay in Calgary…for locals and visitors! When choosing where to stay in Calgary, this area may not jump out at you, but Kensington Road is very trendy street with local merchants, coffee shops, pubs, winebars and restaurants that local residents take great pride in. This area saw a major revival in the nineties, and is now one of the more creative areas of the city. You can walk into downtown over the Louise Bridge or take the LRT from Sunnyside station. Kensington Riverside Inn — This is a lovely upscale boutique hotel in an equally lovely neighborhood. A walk across the bridge and you’ll find yourself downtown. Elegant features throughout, an award-winning restaurant, beds like clouds, and soaker tubs. Easy to explore all that Kensington has to offer. River Wynde Executive Bed & Breakfast — Kensington Village right at your doorstep with all sorts of trendy shops and restaurants. Shared bathrooms, but cozy nature-themed rooms, a daily hot breakfast that guests rave about. Located on a peaceful street with a wonderful back patio area, kitchen facilities available to use and free bike rental. For stays in the Hillhurst/Kensington, we’d also suggest checking out HomeAway, VRBO, and – of course – Airbnb to find a holiday apartment. If you’re in Alberta for a ski holiday, consider staying in Canmore, a small mountain town that lies about an hour’s drive west of the city of Calgary. While it’s not part of Calgary, I’m including this in my Where to Stay in Calgary guide because many visitors come to the city specifically for skiing and snowboarding, but don’t necessarily realize that most of the top resorts are still an hour or two drive from the city – driving time that severely cuts into your time on the hill. If you stay in Canomre, the ski resorts of Nakiska, Mount Norquay and Sunshine Village Ski Resort are within easy reach, and Lake Louise, which is known for its views, clear blue lakes, and ski resort, is just a bit further. Canmore is full of restaurants, bars, boutique shops and local artisans…as well as the fresh mountain air! Staying in Canmore? Book a Private Transfer from Calgary International Airport to Canmore. Falcon Crest Lodge — A great choice for a quintessential ski holiday. Fresh mountain air, unspoilt views, patio/balcony with a barbecue grill and a fireplace for each room. Heated underground parking, kitchenette units are available for longer stays and on-site hot tubs are available to soak after a day on the ski hill. Blackstone Mountain Lodge — Conveniently located right off the TransCanada Highway. Hot tub and BBQ facilities on-site and free parking. Kitchenette units are available for longer stays, on-site fitness centre, great views, and walking distance to the centre of town. Creekside Villa — A small 12 room inn with cozy rooms and lofts each with private bathrooms and coffee makers. The property features lounges, an outdoor fireplace to cozy up to and a games room with billiards and ping-pong. Guest can also enjoy free homemade cookies and hot drinks. For those looking for a winter holiday/ski vacation, but wish to be closer to the city, Bowness is an area of Calgary which, up until the 1960s, was a separate town. I’ve included it in my Where to Stay in Calgary Guide as good area to stay in Calgary for winter sports! Largely a residential suburb, Bowness is very close to the Trans Canada Highway if you’re heading to the Rockies, and to Winsport, Calgary’s urban ski hill and winter sports center that’s a legacy of the 1988 Winter Olympics. The park offers guests a chance to try Bobsledding, Luge, go skating, snow tubing, or skiing / snowboarding. Due to its proximity to the Trans Canada Highway, which leads out to the mountains, Bowness boasts quite a few equipment rental shops where you can rent your skis, snowboard, snowshoes, or even a roof rack for the car so you can transport it all to the mountain. Sandman Hotel & Suites Calgary West — Directly across from WinSport (formerly Canada Olympic Park), standard, clean rooms with coffee makers and very close to the TransCanada highway for a quick exit to the mountains in the morning. The hotel has a pool, fitness centre and offers free parking. Four Points by Sheraton Calgary West — Located across from WinSport, you’ll find tasteful, modern rooms with a microwave, fridge and a coffee maker in each room, as well as a balcony. The hotel features an indoor pool with a waterslide and a hot tub to rest weary legs after a day on the slopes. Wondering what area to stay in Calgary for some good ol’ cowboy tourism? If you’re looking to visit some of the old western towns south of the city, consider staying in South Calgary, which has great access to the highways, but also great public transit access to downtown. Mainly suburban with lots of restaurants, shopping malls and public transportation options, South Calgary is also much quieter. Deerfoot Trail and Macleod Trail are the two main thoroughfares in South Calgary, connecting south of the city to form Highway 2, which runs all the way to the US border. More importantly, HIghway 2 passes through many pleasant old western towns such as Nanton and High River, and connects to roads leading to other towns like Black Diamond, Turner Valley and Longview. Staying close to Macleod Trail or Deerfoot trail will give you easy access to Highway 2. Additionally, South Calgary gives easy access to The Cowboy Trail, aka Highway 22. Highway 22 follows a ridge at the start of the foothills, the hilly land immediately before the Rocky Mountains rise up, connecting farms and ranching communities that have been in operation since the mid-1800s. This is where you’ll find the real cowboys, and you can take organized Cowboy Trail tours or trail rides, or you can drive it yourself. If you’re wondering the best area to stay in Calgary for Spruce Meadows — the equestrian and show-jumping facility — consider South Calgary as well. Wingate by Wyndham Calgary — Contemporary rooms each with a microwave, fridge and coffee maker, an indoor pool, fitness centre and business centre. The hotel offers free parking and car rental services as well. Easy access to Macleod Trail and close to shopping complex, restaurants and a movie theatre. Holiday Inn Express Calgary South — Easy access to Macleod Trail, close to shopping and restaurants. The hotel offers free parking, has an indoor pool, fitness centre and hot tub. The rooms feature a microwave, refrigerator, and coffee machine, and serves daily hot breakfast. Courtyard by Marriott Calgary South — Great location for road trips with easy access to Highway 2 south. In the same complex as Residents by Marriott for longer stays. It has a pool/waterslide, across from restaurants, a pub, and Good Earth Coffee. Contemporary rooms, fitness facilities and on-site parking. When choosing where to stay in Calgary, it’s helpful to know a little about the street numbering and quadrant system. The city as a whole is divided into four quadrants, south-east (SE), south-west (SW), north-east (NE) and north-west (NW), and you will see the abbreviations on most mailing addresses. Add to that, Calgary’s downtown is laid out in a grid system that makes use of the quadrants for its street names. Centre St. (and Macleod Trail, south of downtown) marks the border between east and west, with one block to either side being 1 St SE and 1 St SW. If you are east of Centre Street, all addresses will have SE to it, and if you’re west of Centre St., all addresses will have a SW added. 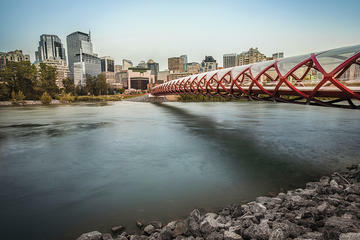 The Bow river is the border between north and south streets, meaning most of the streets in the downtown core are “south” streets, and those north of the river are “north” streets. However, as a general rule, the east-west streets are called “avenues,” at least in the downtown area. When downtown, the streets and avenues are numbered, starting at Centre Street (zero, for the east-west streets) and the Bow River/Memorial Drive (zero for the north-south avenues). If you walk straight west from Centre Street in the south part of downtown, you’ll cross 1st Street SW, 2nd Street SW and so on. And if you walk straight east from Centre Street in the south part of town, you’ll get 1st Street SE, 2nd Street SE, etc. Once you figure out this system, it is easy to navigate anywhere in downtown, and figure out how many blocks you have yet to go! Public transport in Calgary is good, but not great. In general, Calgary is the epitome of ‘urban sprawl,’ and the transit system reflects this — it’s main purpose is to shuttle commuters from the ‘burbs to the downtown core, and back again. As a tourist, this means you’ll be able to get to many of the places you want to go, but may have to rely on private shuttle companies (to get out to the mountains, or into the city from the airport) and a car to do everything on your list. That said, the LRT (Calgary’s answer to a subway system — it’s all above ground and is generally referred to as “The C Train”) can get you to many of the places you probably want to go. If you’re in town for something specific like the Calgary Stampede, an event at the Telus Convention Centre, a Calgary Flames NHL hockey game, or a Calgary Stampeders CFL Football game for example, all of them are easily accessed via the LRT. The city currently has two C Train lines, both of which converge along 7th Avenue downtown (click here for a PDF map of the C Train routes). This 7th Avenue downtown zone is actually fare-free, so if you’re just going between two ends of downtown, you can jump on the C Train for free between the City Hall and Downtown/West Kerby stops. If you’re travelling outside the far free zone, you can buy tickets at all C-Train stations using machines. You can plan routes and trips using the Calgary Transit trip planning website, here. Every July, Calgary’s population swells for the Calgary Stampede — a massive annual party that spreads across the city. And of course, accomodation gets tight. As Calgary’s downtown isn’t particularly large, there are many hotels within walking distance to the Stampede. Downtown, the Beltline, and the East Village are the best areas of Calgary for the Calgary Stampede, all of which have hotels within walking distance to Stampede. In the Beltline, both Hotel Arts, which is known for fun Stampede parties and Fairfield Inn & Suites are well-located for Stampede. In the East Village, consider the Hilton Garden Inn. Hotels on the Beltline-edge of downtown will be most convenient for Stampede (for example, Hotel Le Germain, The Fairmont Palliser and Calgary Marriott Downtown Hotel) , but realistically any hotel in Downtown will probably do! If you have family attending U of C, and are in Calgary to visit, try to stay in the northwest of the city, near the campuses, or downtown / Kensington, both of which are linked to the U of C via the C Train. The University of Calgary has a 3-star on-site hotel (Hotel Alma) which is probably the most convenient option. There are also a cluster of budget-friendly hotels and motels to the east of McMahon Stadium, only a few minutes away from the U of C Campus. If you use Booking.com, you can search for hotels near the University of Calgary simply by entering “University of Calgary” in the destination field — follow this link, and it will take you straight to the results of that search. We think the best hotels near Calgary Airport are the two terminal airports — the Delta Calgary Airport and the Marriott In-Terminal Calgary Airport. Attached to the airport, these are especially awesome in winter, when you don’t have to brave the cold to reach your hotel or the airport. If neither of those suit your needs, you can use Booking.com to search for hotels near the Calgary Airport simply by entering “Calgary Airport” in the destination field — follow this link, and it will take you straight to the results of that search. So Where Should You Stay in Calgary? If you’re still asking yourself where is the best place to stay in Calgary, I’ve tried to summarize the different places to stay in Calgary below – hopefully it helps with your Calgary trip planning! Most visitors to Calgary will stay in the Downtown Core or the Beltline for ease of access to most of the city’s attractions as well as access to the LRT (the C Train). If you are visiting Calgary for business, choose a hotel in the Downtown Core. Many of the buildings are connected by a +15 network, a system of interior pedestrian bridges, to keep you warm in the winter. If you choose a hotel connected to Calgary’s +15 network (the Calgary Marriott, Fairmont Palliser, Ramada, Sheraton Suites, and the Sandman are all connected, to the best of my knowledge), you can go from building to building, meeting to meeting, to the mall, the gym, and back to the office without actually going outside – which is great on the coldest winter days. You also have free access to the LRT while in the free-fare zone along 7th Avenue. If you’re in town for a party, and want the best area of Calgary for nightlife, consider staying in the Beltline. The best areas to stay in Calgary for the Calgary Stampede are downtown, the Beltline and the East Village. The same goes for a trip to catch hockey, as the Saddledome is adjacent to the Stampede grounds. You may be wondering how we came up with all these hotel recommendations. The thing is, we’re always hearing from readers planning a trip, and asking about accommodation recommendations. And of course, we’re happy to help. But on our own travels, we can only stay in so many hotels. So no…we haven’t stayed in every hotel we recommend in our Where to Stay in Calgary guide. Especially since I lived there for so many years! Our goal with this Where to Stay in Calgary Guide (and our Where to Stay in Vancouver, Where to Stay in Montreal, Where to Stay in Prague Guides…you get the idea) is to make sure you find the best area for your travel preferences and style. That’s why we only write guides when we can find a local – or someone who knows the city well – or have lived in the city – to provide expertise. We know all too well from personal experience that the area in which you stay can make or break a trip…and we definitely want to help you ‘make’ it. So…the hotel recommendations in our Where to Stay in Calgary Guide are based on what we’d suggest to friends and family with different budgets and trip styles, if they were coming to Calgary. We haven’t personally been to these hotels, but we’ve researched them carefully: is it in a good area that seems safe? Is it in a good location for enjoying Calgary? Have past guests left fantastic reviews of the property? Would I tell my mother or sister-in-law that this is a good place to stay? If it meets these criteria, I’ve added it to the list. Ultimately, our goal is to help you have a great visit to Calgary, and to do so without having to spend hours choosing the best place to stay! Hopefully we’ve succeeded…but please don’t blame us if we haven’t – at the end of the day, we expect you’ll check the most recent reviews as well, using our suggestions as a starting point and framework, and choosing the best area to stay in Calgary for your own very unique trip! Like this Guide? Pin it for Later! Thanks for this very detailed post! Canada has always been the “other” place I’ve always wanted to live. Although I’ve not been there – yet! I had no idea there were so many wonderful places to stay over on a trip to Calgary! Or that there’s so much to do! A friend of ours – he’s South African – recently emigrated to Canada with his Canadian wife and whenever he gets us on the phone he’s like “I’ll pick you up at the airport the day after tomorrow!” He can’t stop talking about how safe and clean Canada is. Sounds like a wonderful place!